Discussion in '348/355' started by 348steve, Feb 13, 2019. My 348 project is a winter game, so I have lots of time to do it right. As part of doing it right I want to make sure I get value for my money when buying parts, with quality being the 1st goal. I have noticed that there are numerous suppliers of parts, all appearing to have good customer service and commerce platforms. I could order from any. My question is in regards to part manufacturers. If two suppliers are selling the same Ferrari Part Number, and claim they are authentic Ferrari parts, does that mean they are identical parts (manufacturer)? How's about #185577 (the chain oil pump chain tensioner) as an example. Its obvious when you buy 3rd party parts that you know where they are coming from (i.e. PT348 bearing kit from Hill Engineering), but what about these actual Ferrari part numbers, are they all the same or not? 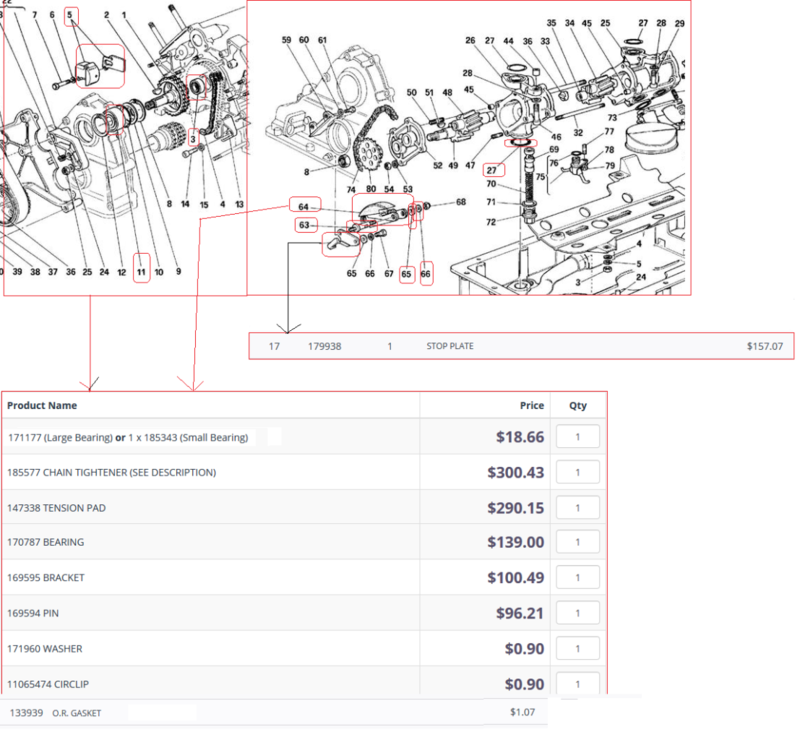 Any advice on parts procurement is much appreciated. Websites usually specify if they are OEM or non-OEM. They will also usually specify if they have been superseded (although some will send you the newer part without telling you). One website did seem to have difficulty applying this word (in its various forms) ... "supersedes", "superseded" and "superseded by". You had to assume they were sending you the right part. Knowing your car's assembly number and year of manufacture can be critical. Perhaps if you fill out your profile page so we know where you're from, specify if your car is LHD or RHD and what version of the car you have? When buying parts, factor in postage, local taxes, import duties, etc. In some cases, postage is billed separately, and you go nuts trying to figure out why you have this extra item on your credit card with a name which seems unrelated to the vendor. Sometimes it pays to add as much information on the ordering form as you can. At least that way you can shift some of the blame when the wrong part arrives on your doorstep. Anyway, after a while, you get used to each seller's "quirks". 348steve and Dave rocks like this. Number Part#185577 is Part#185577. Especially with ferrari specific parts like that one that has no application outside ferrari. Sometimes with pats like relays for example it can be listed as oem part but its a cross reference to an equivalent part. For example an 02 sensor is the same as used on a volvo so many times bosch parts as an example can be cross references and there is no need to buy the ferrari part its the same part. Most resellers do not try and deceive they list eom or compatible usually. I h ave saved much money using ebay resellers for oem parts and cross reference parts especially. However I typically find Ricambi has darn good prices often cheaper than other resellers on ebay for instance. In fact just did another $450 order 20 min ago. Some parts like ball joints and tie rod ends there is no reason to use Ferrari OEM they cast 5x for no real reason. I used Maserati parts on ebay for whole front end. I did the updated 360 oil pump chain tensioners too if your actually doing those. Good call. Berning and Qavion like this. Tell me more about updated tensioner? Here are the parts I did when I had full service done. That's from Ribambi's site. Don't forget #11 the oem bearing is failure prone Hill makes one now. Check #14 for ball update from Roller, again failure prone it may already be updated. Tack the belt pullies the fences are pressed on. Few posts out here on them as well. Yes, all that and a whole lot more !!! I have 9 more of the washers and tiny spring clips that hold the 360 tensioner on the new tensioner stud if ANYONE needs one. I'll send one of each. that's a great little cart! basically, it's a new stop, a new stud, and a 360 style spring tensioner. I had to buy the washer and spring clip for the stud in quantity of 10.
the original 147337 with the washers and the nut. Thanks Daniel for the washer and spring clip add to the "additional items" needed!